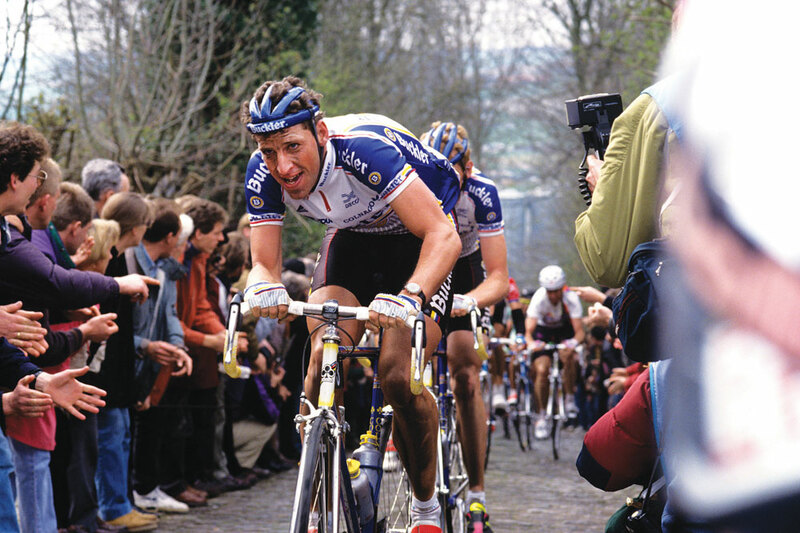 The 1992 Tour of Flanders followed the usual pattern — an escape going early in the race. But did the peloton know what they were doing by giving unknown Frenchman Jacky Durand a 22-minute head start? There were 10 minutes to go until the race began. Riders were beginning to roll to the start line in the square in Sint Niklaas, which was crowded and buzzing with anticipation. It is a characteristic of the Tour of Flanders that it’s not just the riders who are preparing for a day-long race across the countryside: many of the spectators were poised to dash for their cars so they could catch the action at multiple points through the day. All of them were better prepared than Jacky Durand. The 25-year-old Frenchman, who rode for the Castorama team, needed help. The previous evening, he had changed the cleats on the bottom of his shoes but when he got on his bike and tried to clip into the pedals, he found he couldn’t. The screws he had used were too long and the cleats wouldn’t snap into place. Durand’s own mechanic didn’t have any so Durand had spent 10 minutes running from team car to team car, with no luck. Finally, he reached the car of the Swiss Helvetia team. The mechanic searched around in a tool box and came up with some screws that were the right length. With the clock ticking down and the voice of the commentator on the public address system reaching fever pitch, Durand, who was all fingers and thumbs by this point, re-attached his cleats. By the time he got to the start line, he’d already burned plenty of adrenaline but he wove his way through the riders who had already massed for the start so he could be near enough to the front to see what was going on. Thomas Wegmüller, a 31-year-old Swiss rider with the Festina Watches team, was also up at the front of the field. A fortnight earlier, he had helped his team-mate Sean Kelly lay the groundwork for that incredible pursuit and capture of Moreno Argentin on the Poggio at the end of Milan-San Remo. It meant the Irishman was wearing the World Cup leader’s jersey. But the day was more significant than that. This was probably 35-year-old Kelly’s last chance to win the Tour of Flanders, one of the few races to have slipped through his net. “My work was to go in the breakaway,” says Wegmüller. “They told me in the morning, before we left to go to the start. When Sean says ‘go in a breakaway’ you don’t argue about it. You have to be in it. The tactic was very simple. If I am in the lead, it means Sean can say to the others ‘Look, I have Tommy in the lead, so I can’t chase’. Durand, with his cleats sorted now, wasn’t thinking in terms of winning the race. He was a third-year professional, ranked 217th in the world. The Tour of Flanders wasn’t even his team’s biggest priority that day. Cyrille Guimard, the Castorama boss, wasn’t in Belgium. He’d gone with his A-listers to the Grand Prix Rennes in Brittany. It may sound astonishing that any team would favour such a small race over De Ronde, but the GP Rennes was winnable. It meant something to the team’s sponsors, a chain of DIY stores, and would mean a decent show in L’Equipe. Besides, Flanders was not a happy hunting ground for the French. Only two Frenchmen had ever won the race, Louison Bobet in 1955 and Jean Forestier the following year. The previous year, Durand had ridden the race and made it as far as the second feed. This time his goal was to finish. A place in the top 20 was the height of his ambitions. He knew that to be involved in the second half of the race, he had to get ahead. He wasn’t as familiar with the roads as the Belgians. He didn’t know every hump and hollow on the cobbles. He couldn’t tell you the order of the 14 climbs. But if he was safely up the road, it would take a good deal longer to sink to the bottom than if he hit the climbs at the back. Durand’s team talk had been minimalist. With Guimard elsewhere, Bernard Quilfen was in charge. “Thierry Marie was going to be our leader but he crashed on the last day of the Three Days of De Panne and broke a rib, so Quilfen said we had no leader and that we had carte blanche. Do your best. There were four of them, the others being two Belgians — Patrick Roelandt of the tiny Assur team and Hervé Meyvisch of Carrera. They got their gap after 43 kilometres but it wasn’t easy. “We had to ride incredibly hard,” says Durand. “We spent about 20 kilometres with just 10 or 15 seconds’ lead. The peloton was chasing hard. And then they stopped and we had no idea why. We were away. We spent the next few kilometres riding at 35 kilometres an hour, just so we could recuperate. I was nearly dead and there were still 200 kilometres to ride.” Actually it was 217, but no one was looking as far as Meerbeke just yet. Wegmüller’s presence was the reason the peloton refused to let the rope go slack. Neither Buckler nor Panasonic wanted someone that strong to get away but, after a ferocious initial effort, the two teams cancelled each other out. One would not sacrifice riders to the chase if the other was not willing to commit. The TVM team held the balance of power but they didn’t want to do the bulk of the work either. No one was willing to compromise their chances in the long run. So the peloton eased up and let the gap grow. “Wegmüller was a concern,” says Edwig Van Hooydonck, twice a winner of the Tour of Flanders, who was the leader of the Buckler team. “But no one was worried about the other three. The two Belgians would not make it to the end, we were pretty sure. No one seemed to know much about Durand. He was not well known at all then. There was a feed zone at the 102-kilometre point, with 36 kilometres still to cover before the first hill, the Tiegemberg. The four leaders were working well together, without damaging themselves, and the gap had grown to 22 minutes. They rode on mostly in silence, but when the motorcycle pulled alongside them with the latest time gap Wegmüller did a little calculation and said to the others: “This is turning in our direction now. If we can keep a big lead before the hills, we might have a chance. That was precisely Van Hooydonck’s concern. There had been a concerted effort to chip away at the quartet’s advantage before they reached the hills. By the time the leaders reached the second climb, the Oude Kwaremont, the gap was down to 15 minutes. “I was trying to work out how much time they would lose,” he says. “I was still sure we would get them. It is very tiring being in front all day. Over the Paterberg, Hotonde, Kruisberg and Taaienberg they went. The gap was shrinking but they were doing a good job of plugging the dam. On the Eikenberg, the seventh climb, with seven remaining, they were still 11 minutes ahead. Thirty kilometres to go. Just the Muur and the Bosberg left. This is the endgame, no matter what has gone before. Now the peloton knew they were in peril. The big names were having to grit their teeth and do the chasing themselves. Van Hooydonck, Argentin, Maurizio Fondriest, Frans Maassen and Rolf Golz swapped turns at the front. Durand and Wegmüller were still four minutes up the road. The gap had come down enough for the race organisers to pull most of the team cars and the VIP vehicles out of the gap between the leaders and the chasers. The narrow roads meant they could easily become an obstruction and common sense said that the advantage was going to tumble rapidly. That meant neither Wegmüller nor Durand had access to their team cars for what felt like a long time. “We had no drinks or food for a long time,” says Wegmüller. “They pulled all the cars out because they thought we were soon going to be caught. The Castorama car managed to get through but mine didn’t. Durand’s sports director gave me a bottle of water. Before that we had shared what water and food we had because we didn’t know how long it was going to take for the cars to get through to us. Back in the chase group, the frustration was setting in. Everyone was getting tired. No one wanted to burn their last matches on the chase and leave nothing left to contest the win. But without completing the catch, they were riding for third place at best. That hampered Wegmüller’s plans. “I was planning to drop one of my bombs on the Bosberg, make an explosion and then continue over the top. I was certain Durand wouldn’t come. Maybe he’d match me on the climb but the top is very difficult. It is not flat, it keeps rising and it is very open. I went to the front and started to make a good tempo so he couldn’t attack. Then suddenly, he went faster. I asked my legs for more power but it didn’t come. Wegmüller, too, rued allowing complacency to seep under the door. “I was too sure that I would be stronger than him. This made me do some efforts that I should have saved for the final stages,” he says. “I was not angry because he had worked. He was not sitting back thinking ‘Ah, Tommy will drive us to the finish’. Over in the Breton town of Rennes, Guimard was celebrating victory too. Castorama’s Jean-Cyril Robin had beaten two Belgians — Frank Van den Abeele and Rik Coppens. But the following day, it was to be Durand who took pride of place on the front page of L’Equipe, not Robin.